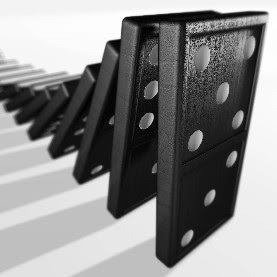 Or, the domino principle. Have you experienced great surprise when you chose something, and not long after you see what else was affected by that change? Sometimes it can be a good thing, but sometimes, it is a very VERY bad thing. For instance. I decided to finish my degree. My university required that I was on campus for the last semester, which was in another state than my home, my family and my occupation. All right. I figured I’d have some things to change and take care of. However. . . I met a man the first week I was in the new state. Now, a year later, I am married. That was a fabulous, but very unintended consequence of my decision.